Hamilton, Jill. Marengo: The Myth of Napoleon's Horse. London: Fourth Estate, 2000. 246 pages. ISBN#1841153516. £14.99. Hardcover. Literally thousands of biographies of Napoleon have been written. It is said that Napoleon is among the top three subjects for biographies (the others being Lincoln and Lenin). 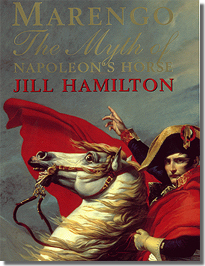 Jill Hamilton has written a brief biography of Napoleon that gives special emphasis to the story of Napoleon's horses, especially the Emperor's most famous steed. The book is really Hamilton's search for the historical reality behind the myth of a horse named Marengo. In his childhood on Corsica Napoleon never owned a horse and, unschooled in formal equestrian skills (he probably had only a little more than a year of formal training while in military school), he first learned a casual, practical style of riding on this rocky island where a mule or donkey was as practical as a horse. Used to using a primitive bridle without an iron bit, Napoleon held his reins loose, controlling the animal by shifts in his body weight. He sat slouched forward on his horse; his toes lower than his heels in the stirrups. Napoleon had a poor "seat," he slid forward and back and from side to side as he rode, wearing holes in his breeches. In spite of this, he was an indefatigable rider- slapdash and reckless. He rode for pleasure as well as necessity. He took many spills from horses, which were covered up (Napoleon was knocked unconscious and nearly killed when he fell from an unfamiliar horse, hitting a tree, the week prior to the Brumaire coup). The first named horse Napoleon is recorded as riding was Bijou, on which he entered Milan in triumph on 15 May 1796. Napoleon, who had a preference for little Arabs over the more popular Thoroughbreds, reconstructed the national studs of France that had been closed during the Revolution as symbols of aristocracy. When Napoleon began his conquests he expropriated the studs from the conquered nations, establishing stallion depots and rebuilding France's horse breeding stock. Napoleon kept a stable of about 80 personal saddle horses, as well as matched teams of carriage horses (Louis XVI, by comparison, kept close to 1,800). Many of Napoleon's own horses were of similar appearance -Arabs with white or light gray coats- making identification of a specific horse today difficult. Baron Fain wrote: "The horses which the Emperor usually rode were Arabians; of small size, greyish-white coat, good-tempered, gentle gallopers, and easy amblers." Napoleon had had from ten to eighteen horses killed under him in battle during his career. The Emperor's horses were thoroughly trained by Napoleon's riding master. Guns were fired close to their heads, swords unsheathed and bayonets crossed before them, drums, trumpets and other instruments played suddenly, flags waved, dogs and other animals driven between their legs, all to teach his mounts to be steady in any situation and accustom them to the unexpected. Las Cases, who accompanied Napoleon into exile on St. Helena, commented that, "The emperor was ill-served in saddle-horses but he had eight or ten of them which were acceptable to him: he only wanted to use these. His main officers would have been ashamed to ride them; they were little, skinny and without exterior, but sweet, gentle and reliable; nearly all were entire [not gelded] and not trimmed [without their tails docked -Napoleon opposed docking a horse's tail, a practice common in the British Army]." Constant, Napoleon's valet, wrote that, "The Emperor mounted a horse without grace... and I believe that he would not have always been very sturdy on the horse if we had not taken so much care to give him only horses perfectly trained." On the other hand, Ernst Otto Odeleben, more critical of Napoleon's lack of equestrian skills said: "Napoleon rode like a butcher...whilst galloping, his body rolled backwards and forwards and sideways, according to the speed of his horse." As for the horse named Marengo, legend has it that it was captured during the Egyptian campaign, that Napoleon rode it on all his famous campaigns from the second Italian campaign, through the retreat from Moscow, to the final battle at Waterloo. The horse reputedly was captured after that climatic battle and taken to Britain, where it was put on exhibition and even today its skeleton is on display in the National Army Museum. However, Hamilton has found that no horse with the name Marengo appears in the registers of Napoleon's stables or in any primary source. Historian Dr. Jean-François Lemaire has stated, "The French archives are silent about Marengo." It is possible that Marengo was a nickname of another horse. Napoleon had a penchant for giving nicknames (Josephine's, his wife, real given name was Rose). A number of his horses had nicknames, Mon Cousin was nicknamed Wagram, Intendant was given Coco, Cirus was bestowed with Austerlitz, Cordoue was also known as Cuchillero, Bonaparte was called Numide, Moscou nicknamed Tcherkes, Ingenu also was Wagram and Marie was called Zina. Napoleon's coach, which had been captured after Waterloo, was placed on display at Bullock's Museum in Piccadilly. Though it has often been said that Marengo was also put on display at the same time, this is not the case. Marengo first appeared on display in 1823 or 1824 in the Waterloo Rooms in Pall Mall. Later Marengo was put out to stud. After the horse's death in 1831, its skeleton was sent to London Hospital to be articulated. Its hide, with its distinctive "N" brand, was lost. The skeleton went on display at the RUSI museum. One of its hooves was incorporated into the Guards' Officer's Mess at Buckingham Palace, another hoof had been lost. Another stuffed Napoleon horse, Vizir, also wound up in Britain. It had been on display at Manchester's Natural History Museum, in 1868 the museum presented it to Napoleon III. In the end, Marengo remains something of a mystery. Hamilton concludes the horse may actually be Ali (or Aly), a horse Napoleon did ride throughout his career and which could be considered a "favorite." Hamilton has produced a slight work, lacking footnotes, internal references or other scholarly trappings. As a biography of Napoleon it is cursory but readable. I would have wished for more information on the operation of Napoleon's stables, on the rebuilding of the French stud farms and on the use of horses in Napoleon's armies. There are a limited number of black and white illustrations. Hamilton has done research in French and British archives to produce her book. Hamilton has also written a book on Josephine's floral artist Redoute. © 1995 - 2011, The Napoleon Series, All Rights Reserved.